Perfect location if you are in the city on vacation. Out of but not far from the French Quarter. Trolley's very handy. The staff at the front desk were very helpful and courteous! The food was delicious! It’s very clean. The workers are polite and professional. They go out their way to help you. Easy check-in process. Brianna did an excellent job providing necessary info and recommendations. Would definitely stay here again! Great location. Friendly staff. The bar/restaurant had good food. Nice and clean hotel, with great amenities. Great customer service. Very nice hotel with a great location. Everyone was great, especially the valet staff. Convenient to the French Quarter;Superdome. Ideal place to stay if you are in town for a game. Overall good. In a good walkable location on Canal Street. Would recommend. Forsure coming back to this hotel, nice rooms, and perfect area. Nice location for starting activities and tours. The restaurant was a great place to start your day. The buffet was excellent. We got there at 11 am and it was very hot in room. Not comfortable, we cut the air all the way down and left. When we came back at 3 am and it was a little cooler but still not to our liking. Also instead of curtains there was shutters, at the break of day light the sun starts to shine in the room and the window shutters do not close. Another problem I had is the I was told the only hotel public bathroom was on the 2nd floor. Well we get to our room at 3 am my guest are taking showers and I have to get to a restroom, I go to elevator to get to the second floor and the second floor closes at 2 am. So no other restroom except for the occupied one in my room. Great Time! First time to New Orleans. Enjoyed the experience. The staff were super nice and helpful. I love the Club Room, definitely worth the upgrade! 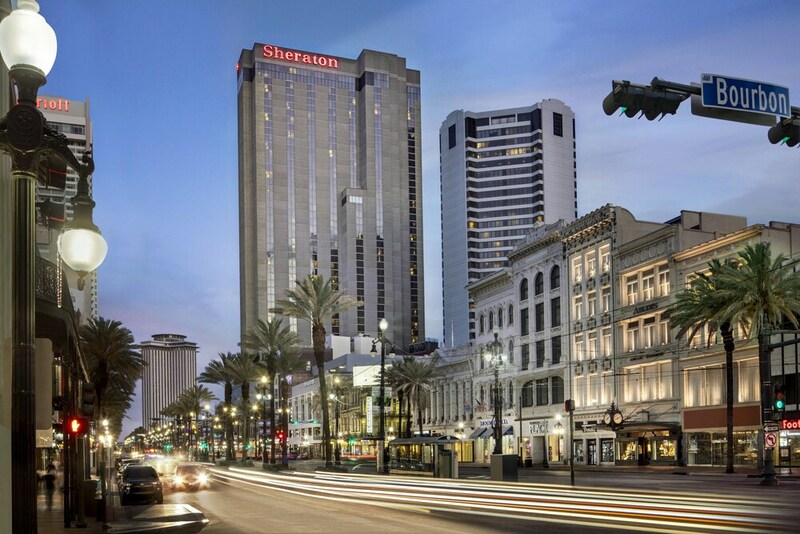 Located in Central Business District, Sheraton New Orleans Hotel is next to popular attractions like Canal Street and Decatur Street. This 1110-room, 4-star hotel has an outdoor pool along with a 24-hour fitness center and a 24-hour business center. In addition to a restaurant that serves breakfast and lunch, you can also enjoy a drink at the pub. Savor a meal from the comfort of your room with 24-hour room service, or get a quick energy boost at the coffee shop/café. Start each morning with full breakfast, available for a fee from 6:30 AM to 10:30 AM. An LCD TV comes with cable channels and pay movies, and guests can stay connected with WiFi and wired Internet. Beds sport premium bedding and the bathroom offers a hair dryer and free toiletries. Other standard amenities include a coffee maker, a safe, and a phone. At Sheraton New Orleans Hotel, guests enjoy an outdoor pool, a 24-hour fitness center, and free WiFi in public areas. Valet parking is available for USD 51.98 per night. The front desk has multilingual staff on hand 24/7 to help with dry cleaning/laundry, luggage storage, and tours or tickets. Additional amenities include a conference center, a 24-hour business center, and coffee/tea in a common area. Full breakfast is served daily from 6:30 AM to 10:30 AM for a fee. Roux Bistro - Restaurant serving breakfast and lunch. Pelican Bar - Pub serving lunch and dinner. Starbucks Coffee - Coffee shop serving breakfast and lunch. Recreation features at Sheraton New Orleans Hotel include an outdoor pool and a 24-hour fitness center. The preferred airport is New Orleans, LA (MSY-Louis Armstrong New Orleans Intl. ): 25-min drive, 15.3 mi/24.6 km. The front desk is open 24 hours a day, and checking in and out are easy with express services. Driving? This property offers valet parking (fees apply).